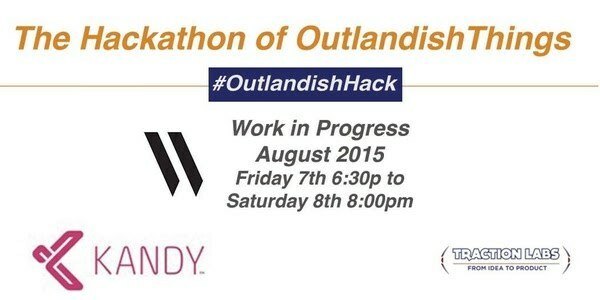 Designers, mobile and web developers, those interested in robotics and the Internet of Things are all welcome to participate in The Hackathon of Outlandish Things. This 18+ event will take place August 7 and 8, 2015 at Work In Progress. “We wanted to have a hack that was focused on the developer and producing creative hacks for apps that they were interested in,” said Alex Donn, Director of Developer Evangelism/Community at Kandy.io. Attendees pitch their ideas, join a team, and spend the weekend hacking. Prizes and API for the hackathon are provided by Kandy.io and Traction Labs. Kandy is a communications Platform-as-a-Service for an all-IP world. Traction Labs is an Innovation Consulting Services Firm that helps move ideas into products. The organizing team chose Work In Progress as the venue for this hackathon because it is close to downtown and houses entrepreneurs from the Las Vegas startup community. “By hosting the event at WIP, we can help spread the word about these wonderful community focused venues as well help keep the momentum going for the local entrepreneur community,” said Donn. In the future, Donn says he and his team are aiming to gather schools as part of this event to drive greater participation from the next generation of developers. Learn more about this event and register here!